I've been experimenting! All the Christmas wreaths out there in Blogland have been calling to me and I decided to make one of my own. 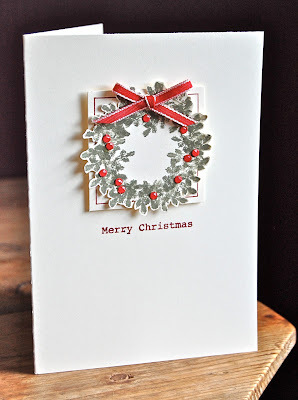 A couple of circle punches and a tree stamp later I ended up with just the sort of card I love - all dimension and acres of white space. Would you guess which stamp sets I used for this card? The frame and the sentiment came from Gifted, a set of five classic, tag-style stamps so useful for adding to Christmas gifts or using as card toppers, and which I also love for the frames and for the variety of elements in the images. The wreath was made using the fir tree from Lovely as a Tree, which is one of those fabulous sets you can use all the year round. Both of these sets are timeless and will be used over and over again for years to come. Gifted costs £26.95 for the set of five and if you buy it with the Jolly Holiday designer paper you'll get a free reel of exclusive ribbon! Lovely as a Tree costs just £25.95 for a set of six. If you'd like to buy them or any other Stampin' Up products, just click here to email me and I'll be happy to help. Don't forget that for every £25 you spend with me, you'll be entered into the prize draw to win my blog candy! Cut an A5 Very Vanilla card blank. 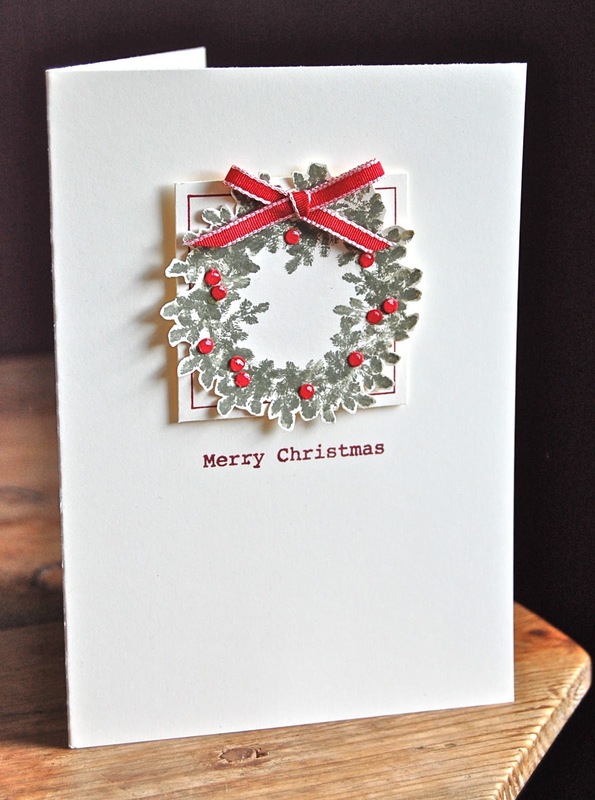 Colour a sentiment with a Cherry Cobbler marker and stamp onto the card front. 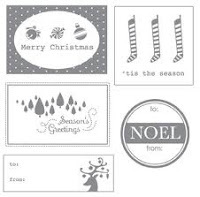 Stamp the stocking image from Gifted onto Very Vanilla card stock using Cherry Cobbler ink. Cut around it with a trimmer. Attach the panel above the sentiment with dimensionals. Now make the wreath: Punch a 1 3/4"circle out of scrap paper. Position the piece with a hole in it as a mask over a piece of Very Vanilla card stock and stamp the tip of the fir tree around the hole to make the inside of the wreath. Take away the mask and use the circle you punched out as a new mask. 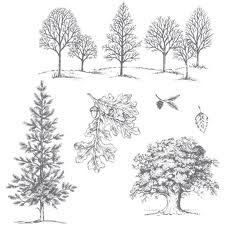 Stamp the tip of the fir tree around the circle to make the outside of the wreath. Discard the circle and trim round the outside of the wreath with paper snips. Glue it onto the frame on the card front. Using a 1/8" circle punch, cut out twelve berries from Real Red card stock. Glue these onto the wreath and add highlights with a white gel pen. Tie a bow in some Real Red 1/8" taffeta ribbon and stick onto the top of the wreath with Sticky Strip. It snowed and snowed yesterday and the schools closed early, so I had my favourite thing - a house full of children! We are fortunate enough to live quite close to the older children's school so it's easy for their friends to all pile back and wait for their parents here. I love watching them chasing around in the snow like mad puppies, forgetting to be on their dignity! But actually, I think that's enough snow for the time being as I need to get out and about in the car! I have a party to go to this weekend for goodness' sake! Have a wonderful weekend, wherever you are and whatever the weather. There really seems to be no end to your cleverness!! How absolutely gorgeous!! So clever Vicky. Love this crisp Christmas card. Matches with what I see outside my window (a bit of green and red and a lot of white) Beautifull. I would have never guessed that you used the tree image to create your wreath. Really nice, especially with the red berries. I like the frame behind it too. I heard that northern Europe was getting a lot of snow and that this was early in the year for your winter. I'm afraid that might happen to us here too in the eastern US. What a clever way to use that stamp! And I love all that white space too! Oh my gosh, Vicky, this is genius! I never would've guessed that the wreath came from the fir tree. I love how you stacked it on the stocking frame and used the ornament sentiment, too. Great mixing and matching! Finally back to the wreath post that I started to read last Saturday. And now that I've read it, I get how you made the wreath. You are brilliant. I would never have thought of that in a million years. Such a wonderful Christmas card!